What Does Slots.lv Have That Bovada Doesn't Have - Here's What! Surprisingly enough there are only a couple of online casinos where US players can play some rather special slots games. One is Bovada who most players will be familiar with, the other is Slots.lv. Both online casinos are owned by the same company, so this would make perfect sense, however the later has lower wagering with bigger bonuses including a new $5000 Welcome Bonus, where a player can triple their initial deposit. Starting smaller, for US players looking for a No Deposit bonus, here is possibly one to jump on right away at Slots.lv. All players that take immediate action between May 5-May 10, 2015 using the code SLOTSBP15, can receive the immediate benefit of a special $15 bonus and judge the casino's Keno, scratch cards and multitude of slot games and see how well they really measure up. Each customer only receives one bonus and this is purely as a special invitation to take a peek behind the doors to see what is on offer. All ensuing activity after the redemption of the coupon will be used towards the 100X playthrough, which the No Deposit bonus is subject to. This includes a winning withdrawal maximum limit of $100 and it must be pointed out that additional winnings will be forfeited should the player go over. All 100X playthrough for this bonus must be derived only from playing scratch cards, Keno, or any of the many different slots games on offer. Winnings will be voided if there is play on any of the other games. 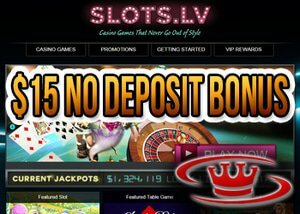 Now one is pretty well versed in what the No Deposit bonus requirements are, it must be remembered that this is time sensitive and expires on May 10, 2015. US Players Are starting to wake up to what's on offer at Slots.lv that can't be found elsewhere, and seizing the moment. Now's the time for some critical evaluation, see if it passes the personal test, whilst there is still time.